The estimation of size-specific effective dose is performed during CT scan of brain of patients using Polymethyl Methacrylate (PMMA) 16 cm reference phantom for treatment planning, included pediatric and adult body patients to evaluate size specific effective dose. Due to lack of sufficient knowledge of dose profile of CT scan, it is very difficult to evaluate size-specific dose estimation. In a recent paper by author AlamgirHossain, the effective dose had been calculated for different patients after CT scan of head or brain. To estimate the size-specific effective dose, different parameters like (AP), lateral (LAT), AP+LAT dimension, effective diameter, dose length product (DLP) and size specific dose estimate (SSDE) had been calculated. The estimated value of effective dose was in the range of (346-587) mSv. The relations of effective diameter with AP, LAT, AP+LAT dimension, SSDE and age of the patients had been analyzed. "By knowing the effective diameter of the slice of patient’s CT image, a doctor can easily estimate the size-specific effective dose for CT scan of the patients. It was also noted that without knowing effective diameter, a doctor or medical physicist can estimate the size-specific effective dose depend on the patient’s age", Hossain Said. In the paper, Hossain shows how the effective diameter of the head as a function of the AP dimension of the patient, over a large range of patient sizes, the best-fit curve using a second order polynomial across all data points demonstrates an excellent correlation coefficient of R2=0.895. The effective diameter of the head as a function of the lateral dimension of the patient, over a large range of patient sizes, the best-fit curve using a second order polynomial across all data points demonstrates an excellent correlation coefficient of R2=0.580. The slope of the curve slightly decreases as a function of lateral dimension, resulting in a slight downward curvature. To measure size specific effective dose, we were also used Lateral (LA), anterior posterior (AP), and effective diameter of the patients with reference Phantom PMMA 32 cm on CT imaging. 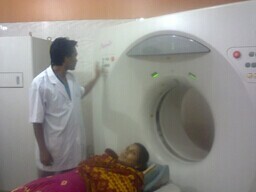 At the time of CT scan of head, a patient was laid on a patient table couch and exposed radiation for 2-3 seconds. Then using controlling computer command, 15-16 images of patient’s brain were observed. These images were analyzed to mark the injured parts of brain. The images were divided into slices. From these different slices, AP and LAT dimensions were measured. For taking the image of a brain, a sufficient current (220 mAs), voltage (120 Kv) were provided on CT scanner. The measured value of CTDIvolwas 36.7 mGy.